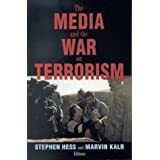 The Media and the War on Terrorism ReviewThis is a superb collection of essays, first-person observations, and recollections of so-called embedded reporters and photographic journalists, edited jointly by Marvin Kalb, a former CBS reporter turned Harvard resident scholar, and Stephen Hess, a senior fellow at the prestigious Brookings Institution. Written in the first person, each of the collected essays takes the reader up-close and personal and shows how difficult it is to know the degree to which such observations are typical or representative of what is going on the overall conflict in which they are embedded. And therein lies the rub, for to some extent it is apparent that even embedded reporter can be manipulated and co-opted by the military, and in several cases that is apparently the case for the individual reporters recounting their war tales. The pieces are both candid and raw; in the sense they somehow manage to catch the very essence of the intricate dance between accurate reporting and the tension with the host army to whom they owe their sustenance and their safety. This tension between the ostensibly objective reporters, on the one hand, and the very partisan military representatives overseeing them, on the other, is what drives the considerable insight the correspondents manage to extricate from the madness of the ongoing battle they cover. This is especially true for electronic media journalists, whose products are almost immediately available to the general public, and who still find themselves both physically and existentially with the troops. Want to learn more information about The Media and the War on Terrorism?